We have yet again whooshed and I mean wahooshed our way around to Friday! It's been another busy week on the range, a lot of it still dealing with Blogger schtuff. More on that later. First, though, I need to just have some happy card talk! Since it's Friday, I'm delighted to say I have another DJKASE for you! This week the copyliment was determined by two challenges. Over at the Inkspirational Challenge, there is a CASE going on (and a Design Team call) of a friend of mine, so I hitched my DJKASE to it. The card artist deserving of this special challenge tribute by Inkspirational is my follower and friend Sandie of London Days. Sandie is a sweet lady and a very talented card artist who has been blogging since 2011. She has a beautiful clean and simple style of card artistry and she has won numerous awards. Sandie is also well-known as a member of several design teams. Recently she helped to start a brand-new challenge called Time Out Challenges. I love the name of that. So true! Our crafty time is our "time out" time when we take the time, and enjoy the time we take, to create. I just wanted to see how many times I could use the word time in a sentence before it got ridicunanas. Back to the challenge at hand, we could pick one of Sandie's cards to CASE from her amazing blog or we could pick one of the cards highlighted on the challenge page at Inkspirational. I picked a card from Sandie's blog at first, but I kept going back to one from the challenge. What helped me decide was a second challenge (below) that just popped up in a timely manner from CAS(E) This Sketch. I am getting a little better with the watercolor splotches. There is a little trick to the ink you use and the amount of water you spray and spritz. I added each element slowly and carefully until I was happy with the array of circles and splats. Then I applied the sediment. I used Stazon ink because my card base is watercolor paper. When I went to lift the stamp off the card, only fifty percent of it was inked. Splat! Not prezackly what I actually said. I took my black outliner and did the best I could filling in the blanks, but, shoot, dagnabbit it all. And, yes, I stamped it off first on scratch paper and then heavily reinked the stinker. If my OCD starts giving me hives, I may stamp the sediment again on a snippet and paste it over the blooper one. Sometimes you're the windshield and sometimes you're the bug. Or, in our community, how about: Stamping is like any other sport. Sometimes you have coverage and sometimes you don't! Sandie, in spite of that, it was a pleasure to copyliment you today! I hope you are pleased with my DJKASE of your bright and beautiful card! Thank you for being a follower and for your continued support and encouragement! Addicted to Stamps and More. Clean and simple. CAS(E) This Sketch. You can see why this sketch impacted my card choice for Sandie! Color Throwdown. Those are birds, people! I thought it was some kind of stunning caterpillar with weirdly long legs hanging off a twig! Simon Says Stamp Monday Challenge. Anything goes. Please click on any of the challenge links for details about rules, sponsors, and prizes! I hope you are able to join in and help support these generous challenge blogs! There is a follow-up below regarding Blogger. I'm delighted that these new friends were able to join before the problems started. It is my pleasure to introduce them to you today! Roxie of Paper Scaper. Roxie has been blogging since 2010. She is a retired landscape designer who enjoys many hobbies, including stamping. Her cards are stunning. Period. Her use of color is phenomenal! I always come away feeling rejuvenated by her happy and bright cards!! Sue P. of Planet Susie. Yes, that's right, she has her own planet! Trust me, you will like visiting there very, very much! Sue has been blogging since 2012 and crafting since she was a little girl. She and I share the fact that we each made our own wedding dress and our bridesmaid dresses. She beat me by one year though! In addition to her wit, you will quickly understand why Sue P. has won so many awards for her works of art!! Sandie of Sandie's Card Garden. Sandie has also been blogging since 2010. 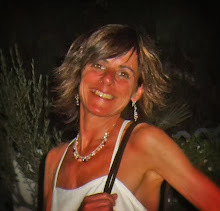 Sandie works part-time and is a wife and proud mother of six children and eight grandchildren. She makes beautiful cards, quite often around photos of her lovely family! Another award-winning card artist, Sandie will leave you feeling fully inspired!! I have heard from several friends saying that they can now follow other blogs again via the blogger "Join This Site" button. I've heard from others that they cannot. Thank you to everyone who contacted the help forum to register your dismay. Now I'm hearing from several people that even if they are able to follow, their picture is not there, either at all or it has been replaced by the gray shadow figure. A couple of days ago I discovered that an entire post of mine had disappeared and I spent several hours researching how to get it back. Aaackk!! It is true that our blogs are run by third-parties and that often Blogger has no control over issues that arise. However. When a large percentage of us have the same problem and we are using different third-parties, it makes sense that Blogger correct the problem responsibly. Often people feel that we should just be glad we get this service "for free." I read somewhere (can't remember where at this point) that companies must be paying Google to track our blog traffic and cookies and cakes and they are making money that way. It's hard to believe they aren't making money somehow and just providing this service to us for "free." Free or not, if a service is being provided, that service should work right! Am I wrong? "Service. servis. Noun. 1. The action of helping or doing work for someone." I hope they fix all the issue for everyone soon! Blogland is a VERY happy place when things are working right!! I'm throwing in a funny I saw on Facebook, just to break up all this serious schtuff and wake you up! "All of a sudden I have lost the ability to paste any text that I've copied on my Samsung Galaxy 10.1 tablet. I've looked high and low on the Internet and the most I could find was there may be a fault with Chrome. I've also tried with Dolphin browser but still no luck. If any of your followers can help I would be forever in their debt! It's driving me bonkers!!" Please respond in a comment if you can help. If it is an involved answer, I will connect you so you can talk directly. Thank you everyone! Sorry this is terribly long, but I won't have this Blooger schtuff as a regular feature. And anyways, I would rather do a long post than have several small ones hit your device. I guess because I don't want you to think, "HER again?!" This way you can take breaks and change the keg on your kegerator. We have another busy few days. Sadly, the Mister and I are going off in different directions in order to attend two funerals. Both deaths were completely unexpected. Well, that sounded dumb, but you know what I mean. They weren't really old people or people who had been ill for a very long time. But then, yippie, we get to see the kids and the twinlets on the weekend and that always invigorates the spirit! Even though they are taking back their sweet Grand Dukey Dog and we will miss him terribly until the next time. Oh, that's right, she made a card. Perfect example of Clean&Simple style!! Stunning cards!! It is always nice to hear it all and get up todate. Love your card, no need to fix, there is no way anyone would notice that you had fixed yourself, it looks brilliant. Your card is a beauty, love the paint splodges. How annoying is that when the last thing you stamp goes wrong - this happens to me all the time! Meant to say I thought it was a caterpillar too! Oh how I wish I could splat and splodge as beautifully as you do Darnell, your card is absolutely stunning! Darnell, your DJKASE of Sandie is amazing! I love, love, love it! So CAS with a touch of grunge is a perfect CASE of Sandie's fabulous style. Great CASEd card, Darnell! I think you did a fabulous job! Sorry to hear that the blooger problems persist. I have yet to experience this problem myself. Hopefully I never will! Sorry to hear about the passing away of friends/family (?) as well. I think I want to steal away your grand dog, by the way. He's sooooo cute! :-). Congrats on your win over at ADSM! I love the cards you selected to DJKASE this week Darnell. Your card is wonderful, I love the design and gorgeous colours. Gorgeous card and great case! I love the funny! I've been lucky and not had any blogger problems, or maybe I just haven't noticed! But I'm sure you're right - nothing in life is free! Love Sandie's style and your card is fabulous!! That FB quote did make me laugh! Enjoy your weekend! Hey, I caught the Mary Chapin Carpenter reference. You must be a country music fan, or maybe that's just a really well used phrase. :) I love what you did with your card. I haven't played too much with that technique yet. Have a happy weekend! What a great card you CASED. Sandie's are great and you did a super job as well. Love the facebook comment. Men - be careful of what you say! Maybe what I thought were computer problems were actually blogger problems. I hope if it is their issue they take responsibility and fix it. I'm so sorry to hear of the passing of two of your friends. It's hard when someone is aging or ill, but the sudden unexpected passings are really heart wrenching. Thoughts and prayers are with you. Very fun card design Darnell. I always enjoy your stories. Oh, I love your card, Darnell! Fabulous take on the sketch! I love your soft splotches and the sentiment looks just fine to me! Loll mentioned the other day about using a SAMJ to stamp the sentiment in case it doesn't stamp perfectly. Then you just ink up the stamp, use the SAMJ and stamp again. For me that won't work cause my SAMJ keeps moving or something. Love, Love, Love your card, Darnell! 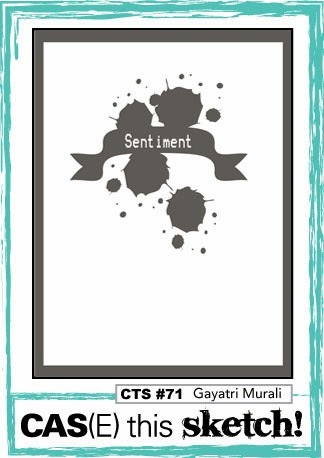 Your watercolor splotches look fabulous, and your sentiment looks great on my screen! You did an amazing job CASEing Sandie's cards...I'm sure she's going to be so pleased! It's always so much fun to visit your blog...Thank you for the great quote and all the little snippets of laughter on your post :-) I'm sure everyone who had a problem with Blogger appreciates how you rallied for them, too! Safe travels to you and the Mister! Fabulous splatting and splotching, Darnell! Your card is WONDERFUL, loving all the splatters! Beautiful CASE...love these type of cards...I need to create one, or two or more...lol!! I am not saying a single thing about blogger and trust me I could, but I am terrified of jinxing myself and after the January I had with it, my lips are sealed...lol!!!! What a cool card! Great CASE on Sandie's card. I really love all your splashes and the colors you chose. CAS perfection! Oh and thanks for joining us at Inkspirational! GREAT CASE of Sandie's card. Aww! you made her feel like a princess, as she should. :) Thank you for sharing and sorry to hear of your losses. Hugs!!! Awesome tak on the casing girl!! Happy Weekend!!! Great take on Sandie's cards! Love that watercolor look at the sentiment is wonderful! Fantastic! Darnell your cards are always so...snappy (I hope that is the right term, I don't well know English),you are a very artist! Super awesome CASE of Sandie's card, Darnell! I so enjoy reading your posts - and as I've just woken up, the FB schtuff you shared did wake me up and got me laughing! Had to show it DH. Thanks for being one of the bright spots in my Friday! Fantastic take on the original card. I love a campaigner, well done you. Well Dippy when your posts pop into my inbox I always go and put the kettle on and sit back!!! lol definitely look forward to them. Great DJKase of Sandie's cards.....I'm so lucky to be on a DT with her, she's so talented and an all round lovely person. Your splats are perfect.....,must have a go at these, so effective. Great FB quote, totally agree. Thanks for highlighting my problem....hoping someone may be able to help. Have a wonderful weekend with the family, I'm sure Duke will be back soon. That was one LONG post. I really like your version of the card. I love splats and rings and water. Excellent CASE - your splotches are top notch! Sandie's card is lovely, think I must be into bright colours at the mo. Darnell you always do a wonderful job of your DJKASE cards, and this one is no exception. I love your watercolour splotches they are very "arty" and would love to know your little "trick" to get this amazing look. I cannot see anything wrong with your sediment in the photo at all. Like your funny too. Hope your spirit is truly invigorated this weekend. You did a fabulous job with this CAS card! Love your splotchy card and from where I sit I don't see anything wrong with the saying! Another great DJKASE! They are so much fun! The drips and splatters look fantastic with the sentiment! Darnell...you are just too funny! I love your little added funny, and so very true! Your card is just so fun and I love that water color technique too, this is one awesome card. I have to agree with you about blogger, I know it is free and I should not complain but it should also work correctly too! Thank you again for taking the time to figure all this stuff out! Love your case of Sandie's card! You are rocking the splatting, splotching, splooching technique. And, I'm in total agreement with Bev - the subconscious crafting part of your brain likely knew that the sentiment needed to match the style of the card! Love the ring thingy's you got with them too! Sorry i do not know anythingabout the pasting text problem...i am hopeless with computer stuff! Fabulous and artsy card Dolly ... and a wonderful CASE of Sandie's amazing cards. Great job!! What a great combination, a bit of Sandie and a bit of Darnell, I love what you do and follow you both on regular basis, and I love seeing how we can pick inspiration from others and add a bit of our own style in the work! Fabulous cards that you cased and I love your take on them Darnell. I've not been able to be around blogland much lately and your reports of blogger follower button problems has me intrigued. I had noticed that there were no new followers for a long time but I had put it down to nobody loving me anymore (awwh). I wonder if this could be the problem instead? First - I think your DJKASE of Sandie's card is perfect! Love the colours, the spatter and the bold sentiment. Thanks so much for playing along with ASM this week! Second - I do like to catch up with your blog - you always start my day with a smile. Have to say that Blogger has been okay for me lately (now you watch it fall over). Take care - have a good weekend! Pretty cards in this post and I certianly appreciate the mention Darnell. Love your splatty card! I laugh that folks can make splatters and blobs and it is still a Clean and Simple card. You can splat and not be grungy!!! Great DJKASE job! And grrrr!!! I hate it when a stamp fools you into thinking it is well inked and then lets you down at the moment of truth. Your CAS is really pretty, your post is really informative, and your FB add is really fun and brought a smile!! Fabulous case of Sandie's cards and your watercolouring looks good! Thank you for joining us at ATSM. Hi Darnell :)What a fabby case-love that effect! I have been following your posts(but unable to comment because of pc trouble again :( seems like Blogger and Samsung tablets are out to get us all! The splotches are lovely, Darnell. They look deliberate and precise. Very classy! What an excellent CASE and a stunning card, Darnell! You did an awesome job with your case...I just love the color splash behind the sentiment...looks fabulous!!! Thanks for joining us for the Color Throwdown Challenge!!! Well, the sentiment looks perfect to me! I love your Case of Sandie's cards & that funny still has me laughing! Thanks, Darnell--enjoy the kids. Priceless picture of Duke! First, my condolences to you & the Mister - we've been touched by a few "unexpected, only in their 50's deaths" this year and it is very sobering. 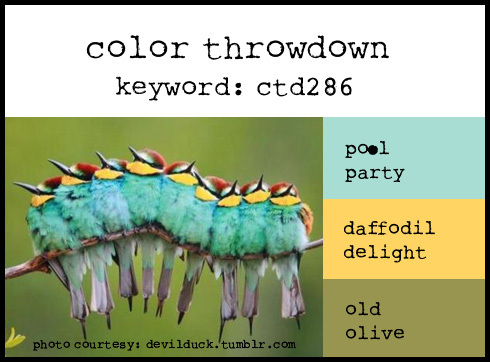 Love the quote, can't believe I saw the CTD as a caterpilar until you pointed out they are birds (?!) and love the perfect arrangement of spotches, splashes and circles on your card! Oh my gorgeous! You are getting good at those watercolor splotches! I need your patience! And I've had the same thing happen when I stamp the sentiment in black STaz-on! Darnell, I LOVE your splat card!! You've splatted a perfect splat all around your sediment : ) Very trendy, very stylish, very cool. Wonderful!! Lovely colour choice; I love the watery effect. Great CASE. Superb CASE! Love all your wonderful splats & splatters! Honestly....I can't see a thing wrong with your sentiment!! Wonderful Case and use of the colors! You weren't the only one that thought it was a caterpillar at first. Thxs for joining us at CTD!! Darnell, you made me smile with your post and I confess I thought it was a caterpillar in the photo as well! You are a master "splotcher" (or should that be "splatterer"?) as your card looks perfect in my eyes! Lovely CASE and I'm thrilled you were able to join us at Color Throwdown this week! Oh my!! Your take on Sandie's card is divine!! Seriously! You really have control over those splatters and splotches. Oh, Darnell, your watercolour splotches are great!!! You did a fabulous job with this DJKASE!! I've been trying to do splotches myself but haven't had much success - think I'll have to give it another try!! Love your card and both of Sandie!! Wow - I have definitely been missing the excitement on your blog. I do have to warn you that these blog issues become never-ending. I still get questions on my posts during the great Google Reader/Bloglovin/Feedly fiasco. I am sorry that you have had to deal with two unexpected funerals. As to your card - gorgeous! I simply cannot do random splotches and blotches. I love the look. Your card is particularly well done with the color choices, the balance and the three solid dots which are a great complement to the blotchiness and splotchiness! I could literally sit and try to 100% CASE your card and I wouldn't love it when I was done. The randomness completely eludes me.